The “Explore More—For Teachers and Parents” section features additional information about the Moon, modeling the Moon, Moon art, and much more. I know I’ve discussed our family’s love of the moon through this blog many times over the years. My oldest daughter, Brooke, was always very curious about this synchronous rotation and natural satellite with Earth and I will admit that I fed her love of it through books like Phases of the Moon and her Uncle Milton’s Moon in my Room toy that would light up her night wall (and she has generously donated her Moon to her little sister’s wall to continue the moon craze in our house.) It’s been a constant and easy subject matter because it faithfully orbits our planet and it’s ever changing face produces awesome things to our Earth like the ocean tides, body tides, and the slight lengthening of the day. I always get excited when Dawn Publications puts out new books each season and their new fall line-up not only included a book about the Moon, it also happens that the author and the illustrator of the book are local Austinites like us! Amazing! 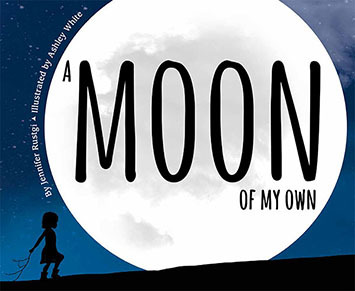 A Moon of My Own is a book about an adventurous young girl’s journey around the world. This journey doesn’t take place physically, it takes place in her thoughts and dreams and she’s accompanied by her faithful companion—the Moon. The illustrations are so vivid and takes the reader on a thoughtfully exciting trip around our planet that is marked with historical landmarks like the Eiffel Tower. Just like the Moon, it follows you around the Earth no matter where you go and yet it is always changing no matter if you are on a different continent or in your own bedroom night after night. The thing that makes Dawn Publications so special are the educational aspect of its books and A Moon of My Own is no exception. The back section of the book includes “Explore More” pages that highlight world geography and an understanding of the phases of the Moon. There is also a link below that includes free activities for educators and you can design your own Moon with craters and do a Moon experiment. I highly recommend reading this book and the subject matter is geared towards children K-3rd grade, but as I’ve learned, the subject of the Moon is wonderful and important for all ages! Educators: Download free activities based on this book!. Parents and Teachers: There are additional resources online, including lesson plans and free downloadable bookmarks. Go to www.dawnpub.com and click on “Activities,” or scan the code on the book. Help for Classrooms! Dawn Publications gives away a classroom set of books each month just by entering the Mystery Contest at www.insideoutsidenature.com. They post the contest and activities from the blog on the Dawn Facebook page every Monday. Don’t forget to like them on Facebook to keep up with their events! About the Illustrator: Ashley White is a graphic artist, illustrator, outdoor-fanatic, peony-gazer, and daydreamer, with an eye for all things fabulous and creative. Her illustrations for A Moon of My Own are inspired by her love of travel and her daughter who wears rain boots every day. When she is not exploring the world, she lives just outside of Austin, Texas, with her husband, daughter, and handsome dog, Tsavo. A Moon of My Own is Ashley’s first book with Dawn Publications.